This office in hierarchy is presently held by one who was embodied as the founder of Zoroastrianism in ancient Persia. He is the highest initiate of the sacred fire on the planet and the governing authority of the energies of fohat. He is over the priests of the sacred fire and the priesthood of Melchizedek. All members of the Great White Brotherhood serve in the Order of Melchizedek even as they serve the sacred fire, but only those who have reached a certain level of initiation may be called Priests of the Order of Melchizedek. Other members serve the purposes of the Order but do not bear the title of priest. Zarathustra has many disciples serving under him, and when the most advanced of these reaches a certain attainment, he will qualify for the office, and the teacher will go on to cosmic service. Zoroastrianism is the one of the oldest of the world’s religions. Zarathustra, its founder, was a prophet who spoke to his God face-to-face. Zarathustra lived in a nonliterate society, whose people did not keep records. His teachings were passed down by oral tradition, and much of what was later written down about his life and teachings has been lost or destroyed. What scholars have been able to piece together about him comes from three sources: the study of the historical milieu prior to and during the time Zarathustra is believed to have lived, tradition, and seventeen sacred hymns called Gathas. Scholars concur that Zarathustra composed these hymns. The Gathas are recorded in the Avesta, the sacred scriptures of Zoroastrianism. It is believed that Zarathustra was born in what is now east central Iran, but that is not certain. Zarathustra’s date of birth is even more difficult to establish. Scholars place it sometime between 1700 B.C. and 600 B.C. The consensus is that he lived around 1000 B.C. or earlier. The Gathas say that Zarathustra was of the Spitama family, a family of knights. 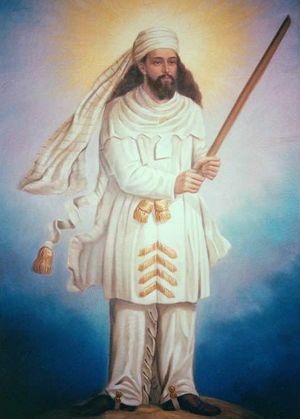 The Greek name for Zarathustra is Zoroaster, meaning “Golden Star,” or “Golden Light.” He was one of the priest class who formulated mantras. Ahura Mazda means “Wise Lord.” Zarathustra recognized Ahura Mazda as the one true God, the Creator of the universe. Shortly after his first vision, Zarathustra became a spokesman for Ahura Mazda and began to proclaim his message. He instituted a religious reform that was far-reaching. His main objective was to stamp out evil, and he preached against the daevas (demons) of the old religion. At first Zarathustra had little success in spreading his message. He was persecuted by the priests and followers of the daevas, and according to tradition, they tried to kill him a number of times. It took ten years for Zarathustra to make his first convert, his cousin. He was then divinely led to the court of King Vishtaspa and Queen Hutaosa. Vishtaspa was an honest, simple monarch but was surrounded by the Karpans, a group of self-seeking, manipulative priests. They convened a council to challenge the revelations of the new prophet and successfully conspired to have him thrown in jail. As the story goes, Zarathustra won his freedom by miraculously curing the king’s favorite black horse. Vishtaspa granted him permission to teach the new faith to his consort, Queen Hutaosa. The beautiful Hutaosa became one of Zarathustra’s greatest supporters and assisted him in converting Vishtaspa. Radiating a blinding light and the sound of thunder, they announced that they had come on behalf of Ahura Mazda in order that the king might receive the fullness of the message of Zarathustra. They promised Vishtaspa a life span of 150 years and that he and Hutaosa would have an immortal son. The archangels warned, however, that if Vishtaspa should decide not to take up the religion, his end would not be far away. The king embraced the faith, and the entire court followed suit. The scriptures record that the archangels then took up their abode with Vishtaspa. The teaching of the hosts of the LORD and the coming of the great avatar of light, the teaching of betrayal and the consequent warfare of his hosts against the evil ones, was understood and propagated. The law of karma, the law of reincarnation, and even the vision of the last days when evil and the Evil One would be vanquished—all of this went forth by the conversion of the king and the queen and the reaching out of the faith to all of the subjects of the land. Thus, the tests were given by the archangels through my office unto these two chosen ones. Thereby passing the tests, they became blessed as secondary emissaries of Sanat Kumara. And therefore, I the prophet and they holding the balance in the earth manifested a trinity of light and the figure-eight flow. Realize the necessary ingredients for the propagation of the faith throughout the earth. The archangels send their messenger with a gift of prophecy that is the Word of Sanat Kumara to every culture and in every age. Thus, the prophet comes forth with the vision, with the anointing and with the sacred fire. But unless the prophet find the fertile field of hearts aflame and receptive, the authority of the Word does not pass unto the people. According to tradition, when Zarathustra was seventy-seven, he was assassinated by a priest of the old Iranian religion. Some accounts say that he perished by lightning, or a flame from heaven. Much of what happened after Zarathustra’s death is shrouded in mystery. Scholars say that his successors reintroduced back into the system the old gods that he had dethroned. By the time the Medes came to power in the seventh century B.C., Zoroastrianism was a major force in Persia. When Alexander the Great conquered Persia in 331 B.C., he killed the priests and burned down the royal palace, destroying whatever may have been recorded of Zoroastrian tradition. About A.D. 225, Zoroastrianism reemerged in Persia and was the state religion until around 651, when the Muslims conquered Persia. Although Zoroastrianism was officially tolerated, the Arab conquerors encouraged conversion to Islam through societal pressures, economic incentives or force. Many Zoroastrians converted or went into exile. Loyal Zoroastrians who remained in Persia were taxed for the privilege of practicing their faith. In later centuries, persecution of Zoroastrians escalated. As of 1976, there were only 129,000 Zoroastrians in the world. However, much of what Zarathustra taught lives on in Judaism, Christianity and Islam. Today Zarathustra is an ascended master whose consciousness bears as an auric emanation of fire that is an all-consuming love, a piercing light that goes to the core of whatever is unreal. We call him a Buddha because he has the attainment of the expansion of the threefold flame and of the Christ mind at the level of initiation that we call the buddhic level. Being in the presence of Zarathustra is like being in the presence of the physical sun itself. The mastery he has of spiritual fire and physical fire is, if not the highest, among the highest of any adept ascended from this planet. If you want to keep the flame of Zarathustra, visualize him keeping the flame, the divine spark, in your own heart. He is the greatest ‘fire-tender’ of them all, if you will. And when you call to him, remember that when you are engaged in the battle of Light and Darkness and you give your call for the binding of the forces of Antichrist, there is no greater devourer of the dark forces than Zarathustra himself. He is an ascended master with buddhic attainment whose auric emanation is one of an all-consuming love. Zarathustra’s retreat is patterned after the secret chamber of the heart, which is the place where the threefold flame burns on the altar of being. Your high priest, who is your Holy Christ Self, retires to that secret chamber to keep that flame. He and other ascended masters can and do visit you there and tutor your soul. Zarathustra has said that we may be welcomed in his retreat when you have the necessary development of the heart. He has not revealed its location. ↑ Mary Boyce, Zoroastrians, Their Religious Beliefs and Practices (London: Routledge and Keegan Paul, 1979), p. 19. ↑ Dinkart 7.4.75–76, quoted in Bernard H. Springett, Zoroaster, the Great Teacher (London: William Rider and Son, 1923), p. 25. ↑ Zarathustra. “A Moment in Cosmic History—The Empowerment of Bearers of the Sacred Fire,” Pearls of Wisdom, vol. 24, no. 13, March 28, 1981. This page was last modified on 11 December 2018, at 22:15.